Nowadays there aren’t a lot of uses for quarters next to flipping them into a drink or bloodying up your friends knuckles, so it’s nice to be able to use one as currency every once in awhile. Especially when it can be used on a good old story packed comic book. 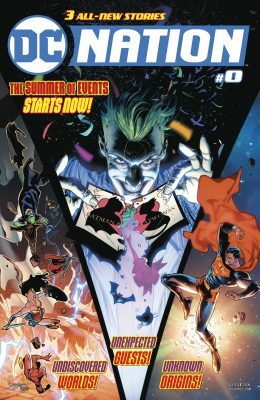 DC Nation #0 is a nice cheap sneak peek at the upcoming events guaranteed to heat up your summer. The second tale is a prelude to The Man Of Steel, written by Brian Michael Bendis and illustrated by Jose Luis Garcia-Lopez. It’s a fun little story that gives us a look at an average day in the Daily Planet Bullpen, as well as introduces a potentially important character in the upcoming mini-series. Many people can’t wait to see what Bendis will bring to the world of Superman. However, if he can keep up the pace he’s been setting so far, I expect he’ll do great things. The final story is a prelude to Justice League: No Justice. It’s a collaboration between Snyder, Tynion IV, Williams, and Jimenez. It gives us a tiny look at some of the new Justice League teams. Even though they will most likely change again by the end of No Justice. It gives a glimpse of the world ending threat that forced the creation of these teams in the first place. It’s a fast paced little story with lots of fun action scenes, and fantastic art and coloring. There is a lot to look forward to from DC, but I think the new Justice League stuff should be at the top of the list. What The What Is DC Nation? 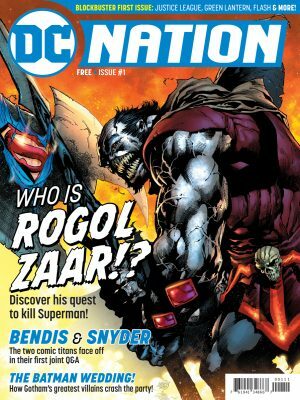 DC Nation is going to be a free monthly magazine that’ll take you behind the scenes of your favourite books, as well as bring you sneak peeks, interviews, and DC related news. This sounds like it’ll be a good way to keep on top of all things DC. Plus free is a even better price that 25 cents. Until #1 comes out though, make sure to grab this issue 0. That way you can check out these great little original stories that you won’t find anywhere else.